2011 is winding down and we're preparing for 2012, the year of the dragon. 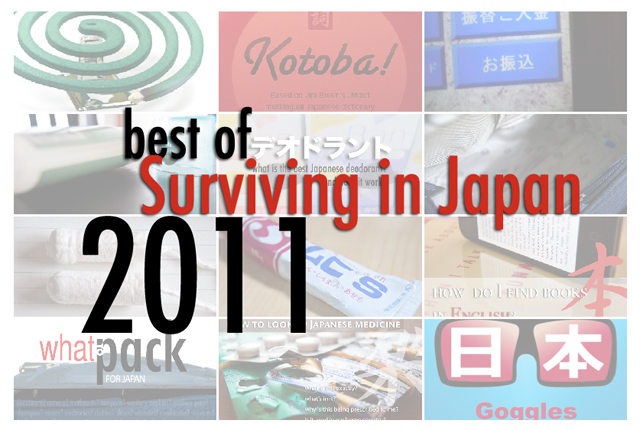 A few things stand out in my mind from the year, most notably the horrific March 11 earthquake and tsunami in Tohoku, and consequent nuclear disaster. Much like 9/11, those images don't really fade. That, and on a lighter note, the birth of our daughter in August this year will also be something I won't forget. Well, I hope I can forget the birth experience itself, but our little smiley girl has been a blessing. As we reflect and also look forward, I'd like to share with you a few things about Surviving in Japan from this past year. A rundown of what to bring, what not to bring, and what you could bring. An extensive Q&A to answer all of your packing for Japan questions. Not all ATMs have an English function for this. An iPhone app to help you decipher what those characters mean. Yes, there are tampons in Japan, and no, they aren't strangely different. This is everything you need to know about tampons here in Japan. The mosquitoes are a huge pain here, so here's everything you need to know about keeping them at bay. A few tech ideas to make life a bit easier in Japan. Tired of the stares? What can you do to blend in? It IS possible to get good deodorant in Japan. When the mosquitoes bite, you may want to read this post. These are the posts this year that were most socially engaging via shares and comments. The rainy season: humid, muggy, sticky, sweaty and, a bit wet. Check out the post for ways to deal. Taking a deeper look at Japanese deodorant. How to keep these ugly, giant pests away, and what to do if they show up. Wondering about a prescription you got? Curious about certain types of medicine? Here's how to look them up. Miss reading in English? Here are a few places to find those sometimes elusive English-language books. These are what I thought were interesting/unexpected search terms readers used via Google to arrive at Surviving in Japan (and yes, all were used more than 10 times). 1. is aojiru as healthy as fresh kale? Thanks to everyone for reading, sharing and commenting on the posts I research and write. I appreciate your support and truly enjoy hearing your stories and comments. More helpful posts to come in 2012! What is your favorite SiJ post, or what post do you think has been the most helpful?